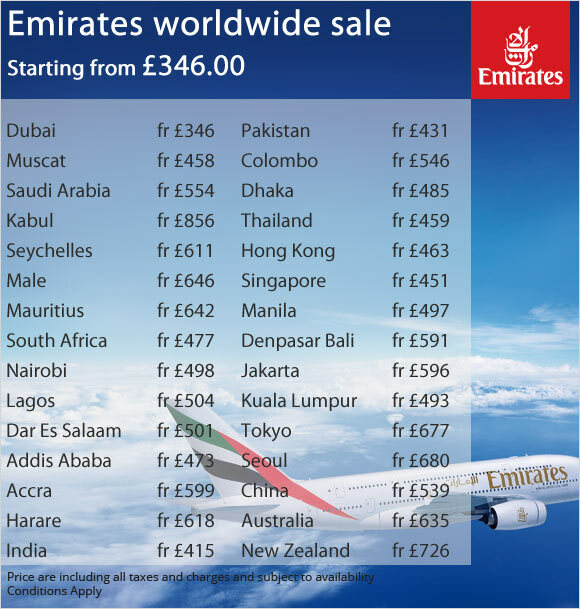 Are you looking for great deals on flights with the Emirates? Then you have reached the right place. Emirates is one of the most preferred airlines in the world that has been growing at pace. It has been honoured with more than 400 international accolades for excellence. Emirates has been much-admired several times over the years for the finest quality that it serves in terms of its in-flight cuisine, the range of in-flight entertainment, and the fineness that is provided by their efficient service. It provides a group of multilingual crew to cater to the diverse needs of multi-ethnic passengers. Emirates connects over 120 destinations on 6 continents. When you are aboard the flight, you’ll experience an award winning service and a matchless level of comfort in each cabin. Emirates fly to a plethora of destinations from London Heathrow, London Gatwick, Manchester, Birmingham, Glasgow and Newcastle via its hub in Dubai. 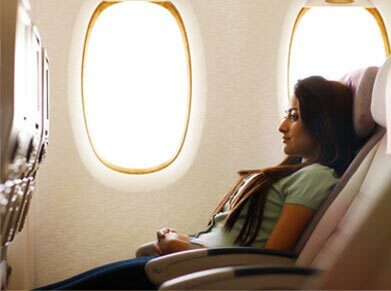 Emirates is equipped with amazing cabin features that let you recline on flat-bed seats. You can experience the lighting that combats jetlag. The cabins are designed to intensify the level of your comfort. You can derive absolute pleasure from the award-winning inflight entertainment system that puts you in the mood. You can ask for movies, music, TV shows and much more on demand. If passengers want to stay in contact with somebody on the ground, they can do so by phone, SMS and email directly from their seat. What’s the latest? Flyers now have a privilege to connect to On-air Wi-Fi on all Emirates A380s, which allow them to acquire an access to the web, chat, tweet, check mails and more. Economy class travellers can look forward to an extremely high level of comfort and the same standards of service we provide right through each airliner. Passengers can expect a laid back flying experience as they can stay relax and stay in touch with their loved ones on the ground. Business class passengers have a privilege to arrive at their destination fully revived with flat-bed seats. Commuters can take delight in lie-flat comfort on a few selected airliners equipped with Business Class seats that change into a flat bed at the touch of a button. 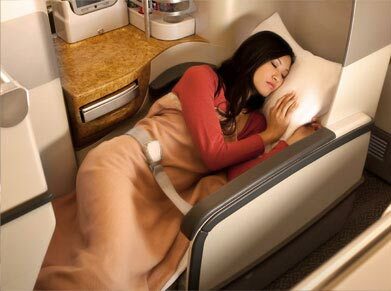 Lie-flat Business Class seats are available on all Emirates A380 aircraft and most Boeing 777 aircraft. First Class Passengers are treated with a royal touch as they are given a privilege to retreat in their own world in the Emirates First Class Private Suite. Travellers get to experience top-notch First service that comprises High Tea, hors d’oeuvres and excellent cuisine. They can simply relax in their Private Suite and take pleasure in the luxury of an in-flight Shower Spa on the Emirates A380. 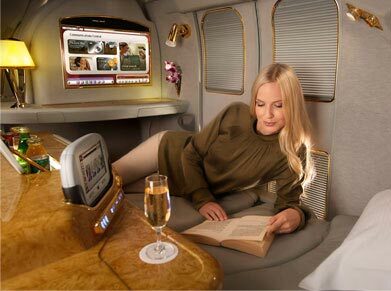 First Class Private Suites are available on all Emirates Airbus A380 and Airbus A340-500 aircraft, and most Boeing 777 airliner. Excite your taste buds with handmade pastries and freshly squeezed juice at breakfast, haute cuisine and first-class wines at dinner. You can treat yourself with a personal mini-bar where you can taste amazing beverages. If you’re are tired and want to have a lie-down, the crew will convert your seat to a flat bed with a mattress. 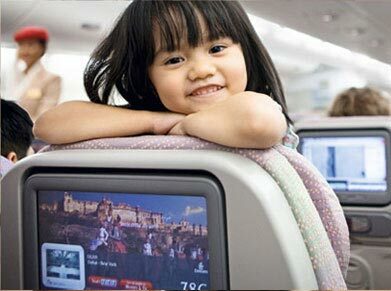 Emirates’ Inflight Entertainment excites the senses of the passengers. In order to enhance the luxury of the passengers flying by Emirates, it has introduced “ice” entertainment. It helps boosting the passengers’ flight experience to fly with pride. Ice stands for information, communications and entertainment. Travellers can grab news being aired on certain news channels and expand their knowledge on Dubai and the Emirates. They can stay in contact with their beloved ones with SMS, phone and email at the convenience from their seat or call friends and family accommodated elsewhere on the airliner. Passengers also can indulge in watching over 1,200 channels of premium entertainment so that they can be engaged right through the flight. They can acquire an easy access to the latest and best movies, television, audio and games from across the globe. Ice OnDemand offers every seat in First Class and Business Class on Emirates’ Airbus A330-200s and A340-300s. They can choose from over 80 movies from Hollywood, over 40 games and matchless music selection. 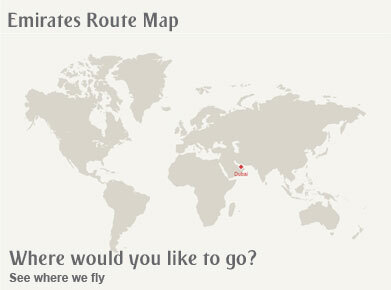 Emirates operates 17 daily flights from UK and Ireland to 6 continents via Dubai. Emirates operates 5 flights from Heathrow, 3 from Gatwick & Manchester, 2 from Birmingham & Glasgow and 1 from Newcastle & Dublin.